Home > Heavy Duty V Belts > V-Belts. A, B, and C Sections. Standard and Kelvar Construction > A-Section (Classcial) V-belts. 1/2" Wide > A102 V-Belt. 104 Inch Length. Power King (HI-POWER II) Industrial V-BELT. > 4L1040K Kevlar FHP V-Belt. Consumer Brand. > 4L1040 FHP V-Belt. Consumer Brand. 4L1040 FHP V-Belt. 1/2” W x 104" Overall Length. Consumer Brand. 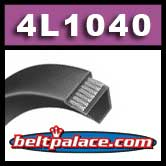 Standard 4L-1040 FHP V Belts. Classical A102 V Belt on light duty applications. 4L1040K FHP V-Belt. Aramid/Kevlar Consumer Brand. 1/2” W x 104" Length. 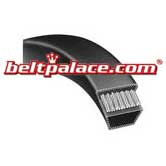 Replaces Classical A102K V-Belt on light duty applications.